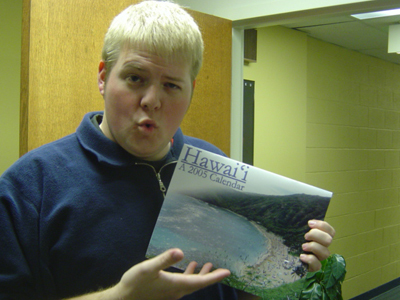 That’s me holding up the new 2005 Hawaii calendar. I was surprised at the quality from a CafePress.com item (I have been less than pleased with them in the past). The calendar features 24 images I took while on my trip to Hawaii, as well as some interesting facts about what you see in each picture. The entire calendar was designed by me (well, the monthly images and cover were, anyway. You can’t edit the actual monthly grids at all, which really annoyed me). Most major U.S. holidays are listed and CafePress.com is now offering a 30-day, no questions asked return policy. So step right up and buy your slick new 2005 calendar! All profits from the crap in my CafePress shop will go right back into keeping alifelessordinary.com online (since it doesn’t pay for itself otherwise). At the time of this posting, I’m only offering the calendar and a bumper sticker. I used to have a mouse mat, but it’s currently being redesigned. Well hold on to your pants, Kris, because that’s the hallway at Fox!